2. Stir together flour, cocoa, baking soda and salt. Beat butter and sugar in large bowl with mixer until fluffy. Add eggs and vanilla; beat well. Gradually add flour mixture, beating well. Stir in peanut butter chips. 3. Drop by rounded teaspoons onto ungreased cookie sheet. Bake 8-9 minutes. (Do not overbake; cookies will be soft. They will puff while baking and flatten while cooling.) Cool slightly; remove from cookie sheet to wire rack. Cool completely. PAN RECIPE: Spread batter in greased 15 1/2 x 10 1/2 x 1 inch jelly-roll pan. Bake at 350F. 20 minutes or until set. Cool completely in pan or on wire rack; cut into bars. PREP TIME: 20 MIN. TOTAL TIME: 35 MIN. 1. Preheat oven to 350°. Whisk together flour, salt, and baking soda. Beat butter and sugars with a mixer on medium-high speed until pale and fluffy, 3 to 5 minutes. Beat in egg and vanilla. Reduce speed to low. Add four mixture in 2 batches, alternating with sour cream, and beat until just combined. Stir in chocolate chips by hand. Cover, freeze for 10 minutes. 2. Using a 1 ½-inch ice cream scoop or a tablespoon, drop dough onto baking sheets lined with parchment, spacing about 2 inches apart. Flatten slightly. 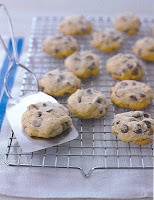 Bake until centers are set and cookies are a pale golden brown, 12 to 14 minutes. I would consider these cookies more like a fluffy chocolate chip cookie. They seem to have more of a bread texture to them and are a little different than your regular cookie (due to the sour cream). Definitely very soft if that is what you’re looking for.